I'm working through my project list and got around to making an AI-1 non-common ground amplifier interface. 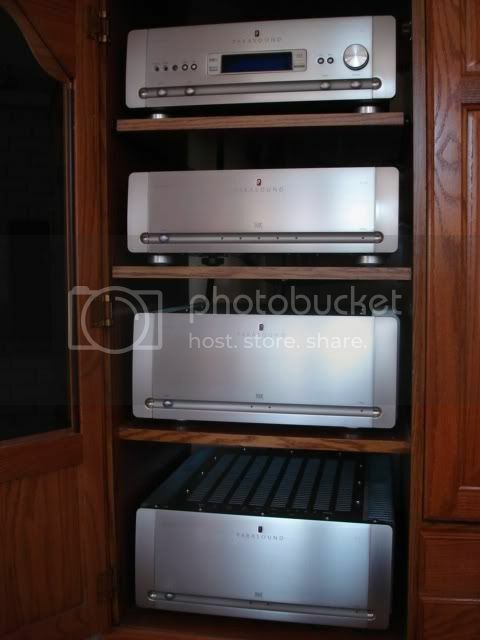 For those who don't know what I'm talking about, the AI-1 was developed by Polk to allow SDA speakers, which require common ground amplifiers, to be used with non-common ground amplifiers. Depending on the associated equipment, the original AI-1 could cause a slight loss of detail. Some users heard a loss of detail with the AI-1 while other users heard no difference at all. 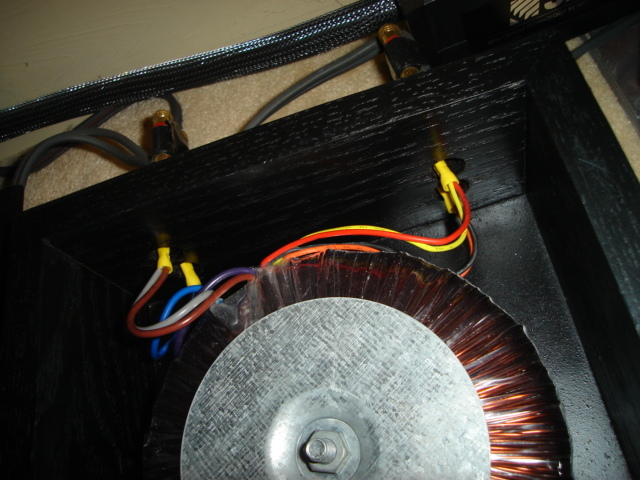 A couple of years ago, Matt Polk provided specifications for an AI-1 based on a toroidal isolation transformer. I sent those specifications to transformer manufacturer Avel-Lindberg and they recommended two of their models, neither of which were exact matches for the specifications. I chose the Y236906 since it was the more robust of the two. Figure 1. AI-1 Dreadnought prototype trials. Such Good Sound all the way around. Figure 2. Dreadnought interconnect cables. The dual primary and secondary windings were connected in parallel to lower the DC resistance and inductance. 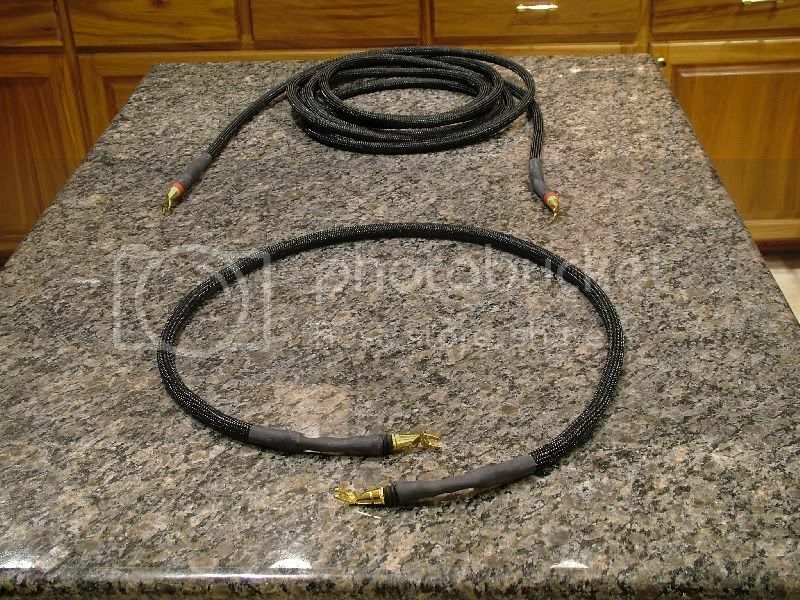 Four 10 foot interconnect cables were made from Monster Cable Z2 Reference speaker cable. The two 12 AWG conductors in each cable were soldered together on each end to make a 9 AWG cable, which is the same wire gauge as my speaker cables. 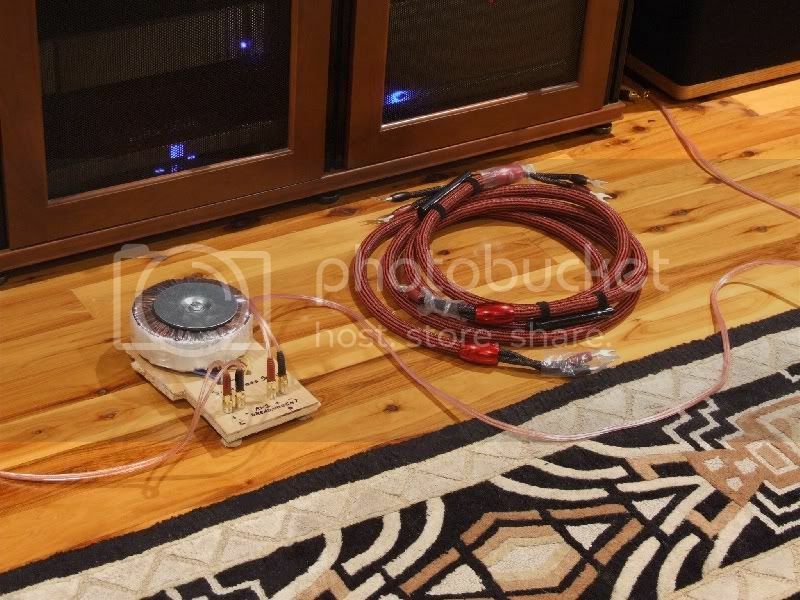 Prior to the Dreadnought, I was running my JC 1 monoblocks in a strapped configuration with the negative terminals of each amp tied together with a 9 AWG cable. The SDA interconnect was also a custom 9 AWG cable. The best I was hoping for was that the Dreadnought would not take anything away. The sound was actually better with the Dreadnought. The sound stage grew a foot on the front, sides, and rear and there was increased detail. Immediately after installation, I heard some upper midrange graininess and the bass was a bit slower and less defined. However, those aberrations disappeared after 10 hours of play. 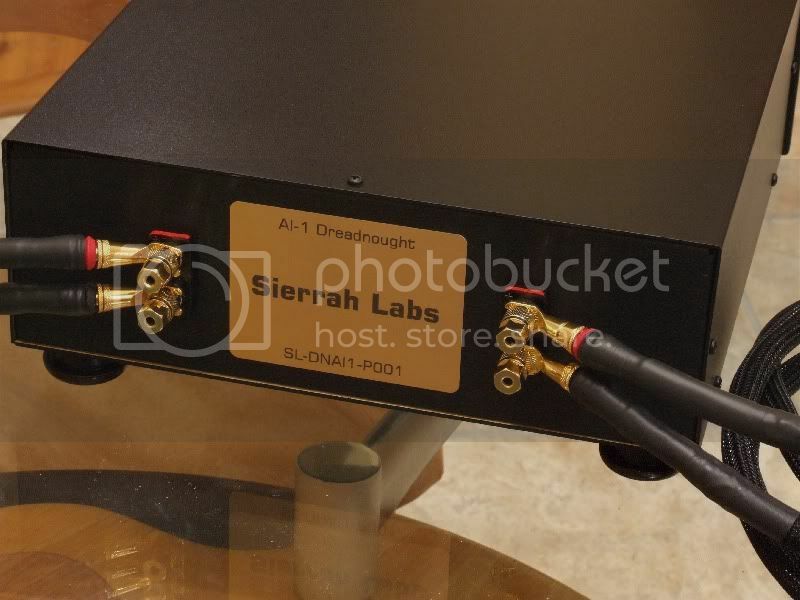 I ran the volume up to 110 dB-C and heard no stress, strain, grit, or grain in the sound. Of course, at that level, I was listening from the next room. I hung on until 105 dB-C then my ears gave out. As I increased the volume from a comfortable listening level of 85 dB-C, the image weight and tactile sensations increased, but there were no deteriorations in any aspect of the sound. Noise measurements taken with an oscilloscope showed the noise in the dimensional signal to be significantly less with the Dreadnought than with the strapped configuration. prior to going into storage. Sleep well old friends. The prototype has been bolted to a smaller wooden board and tucked behind one of the 1.2TL's pending selection of an appropriate enclosure. The monoliths are delirious with delight about what the future holds. I am not sure what to think about all the information but I gotta say that is one beautiful looking system and a beautiful home too. Interesting read and nice writeup (as always). I toy with the idea of higher power amps, and then realize that at the level I listen to them, I'm not sure I'd gain very much. My 2.3's are bi-amped with a pair of Parasound Halo A21's. At a 4 ohm load, I think each amp is rated at about 440 wpc. I'd have to double check on the Parasound specs. I haven't heard the JC1's. They cost about 80% more, and I think I got a lot of power and the good things that go with high power. Detail, image, nice smooth sound with plenty of weight. When I am listening late at night, I don't think the volume level ever goes above -35 to -28 dB depending on the source. I'm intrigued by the JC1's. I think Polkie "Read-a-lot" also has a pair. you can always use that negative strapping cable as an extra ground on your vehicle. it never hurts to have good grounding. or hell, use it to replace your main ground wire from battery to chassis. 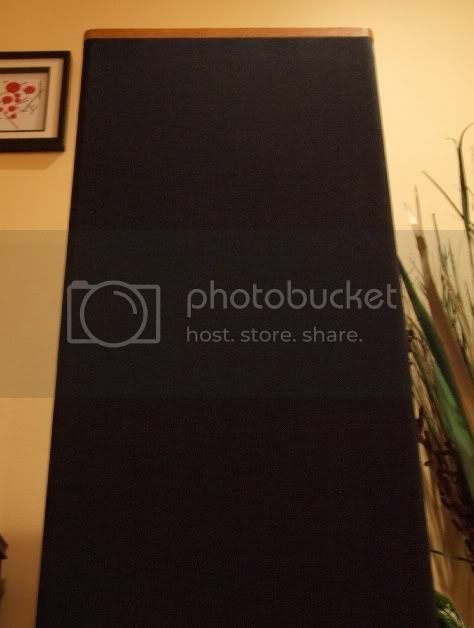 DK Can you disclose the color combination you are using for the pin/blade connections for both left and right speakers. I have been using the exact same Avel Isolation transformer for about a year now and I want to make sure I have mine hooked up correctly. I have mine connected the same way. My initial concern was the different/smaller gauge wiring for the secondary winding. The following picture shows my set up with the Pin connection on the top for the left and right speaker. The blade connection is on the bottom respectively. I guess I can get rid of those nasty crimp connectors and solder the wires to the binding post. "Our unique double-insulated primary leads eliminate an assembly step required by many safety standards." I have no idea what they mean by this. After I read that, I noticed that the metal conductors in all the leads appeared to be the same size (I did not measure them). The leads for the primary just had much thicker insulation. A while back I built an AI-1 using an A/L torroid. I had used a tiny Stancor intitially, that had been recommended by folks and didn't like the result. The torroid I used was smaller than yours, but sounded much better than the Stancor. I'm back to a straight cable with a commond ground amp. Standard equip not worth bragging about. Where is a good place to get the Y236906? I have been looking on the internet, but all I seem to come up with is spec sheets. A while back I built an AI-1 using an A/L torroid. I sent it to F1nut and he did an AI-1 "shootout". You might want to look at it....I'm back to a straight cable with a commond ground amp. I remembered your and Jesse's AI-1 threads and will cite them as references when I post the full report on the Dreadnought. I'm sorry your toroid based AI-1 didn't work out. For me, the installation of the Dreadnought was the beginning of a second SDA honeymoon. Also, I used 16ga wire (not phone wire). So that shouldn't be an issue. I ordered mine by phone by calling the number listed on Avel Lindberg's website. They shipped the same day I placed the order and I received it six calendar days later. Go to http://www.avellindberg.com I bought mine a few months ago for 96 bucks. Considering how much the SRS 1.2's retailed for, I wonder why Polk chose not to include the AI-1 cable for these speakers? That way you could use common ground or non-common ground amps with the AI-1 in place. They may not have wanted to bump up the retail price another $100 for something most of the buyers of these speakers wouldn't need. $3400 in 1989 $ = $5963 in 2008 $. $3500 in 1989 $ = $6138 in 2008 $. Darn right they were expensive. I wanted to buy them back then but the wife said "no way"! I was only allowed to buy the SDA 2's. Got rid of the wife (divorce, not death) and now have the 1.2 TL's. Life is good. My initial concern was the different/smaller gauge wiring for the secondary winding. I never even bothered to look at the actual wire. I just assumed it was a smaller gauge. The Dreadnought has exceeded my expectations in every aspect: overall detail, image weight, sound stage dimensions, etc. Dreadnought prototype prior to receiving its black anodized aluminium enclosure. 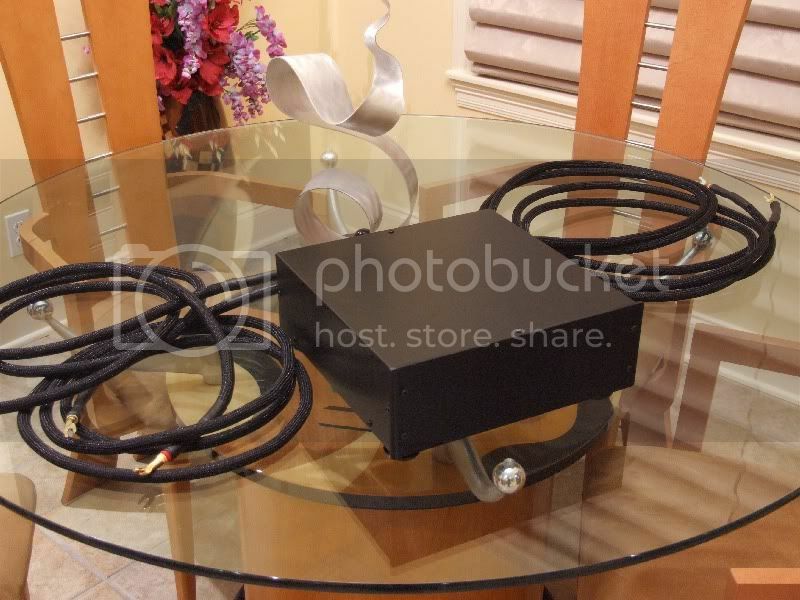 I already knew that the size and quality of SDA interconnect conductors had an effect on the overall sound of the speaker. Naturally, I wanted to evaluate the Dreadnought with two other interconnect cables, one far below it in quality and the other far above it. 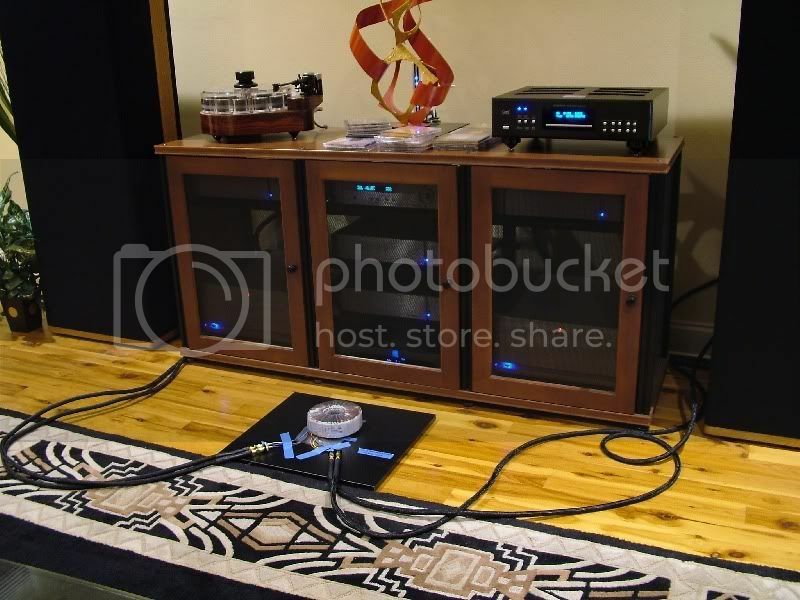 The Dreadnought takes a spin with Monster XP and Audioquest Volcano cables. The Audioquest Volcano speaker cables ($206.25/foot) measured better than the Monster Z2 cables ($3.78/foot), but I didn't hear a difference. 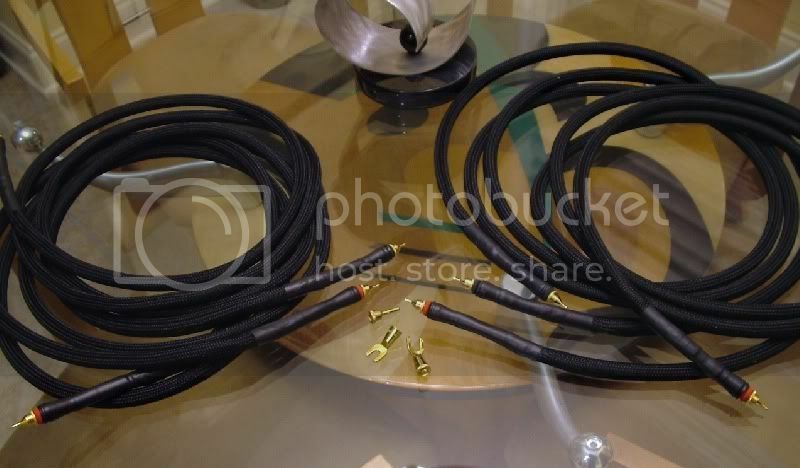 The Monster XP speaker cables ($1.00/foot) measured worse than the Z2 and sounded much worse. The XP cables were dark sounding, shrank the sound stage and made images clump in the areas in front of the speakers and in the center. The aluminium shell provides more than just a pretty face. I expected the aluminium enclosure to provide a little noise reduction benefit. I was surprised to find that it significantly improved the sound. The background noise measured considerably less once the transformer was shielded. I re-evaluated the XP and Volcano cables with the aluminium clad Dreadnought. There was still no audible difference between the Z2 and Volcano cables. The Volcanoes still measured better than the Z2, but the measured performance gap had narrowed considerably. The XP's sounded better, but were still just another shade of bad, even though their measured noise had decreased significantly. The whole thing. 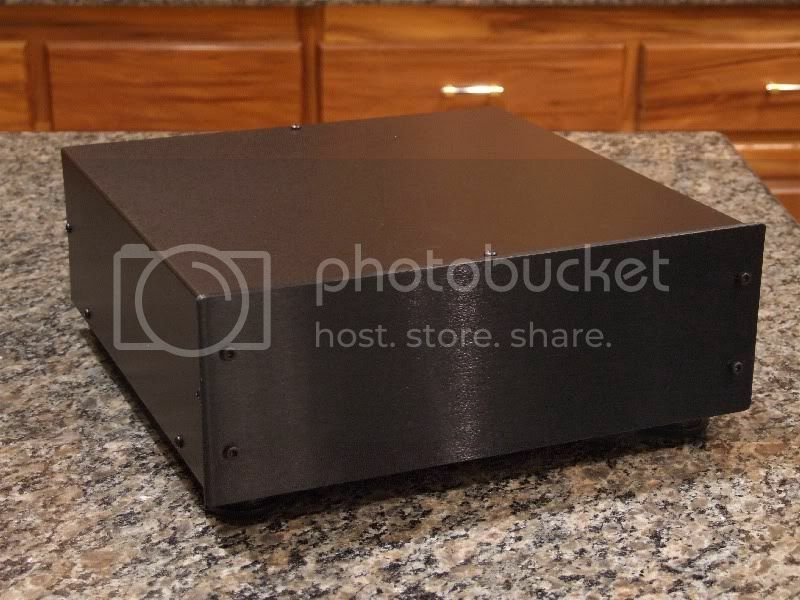 The enclosure measures 12"x12"x4". Hold on tight. The Cardas CCGR-S binding posts make a secure connection. Those interested in making an AI-1 should be mindful that the transformer is not the only component that affects dimensional signal quality. The gauge and quality of the conductors and the type of enclosure can significantly affect the dimensional signal integrity. After I receive my loaner original AI-1's and complete their test and evaluation, I will publish a thorough report of my subjective and quantitative performance analysis. Nice work and write up as always Raife. Very nice work.....on my sooner list for me to build. 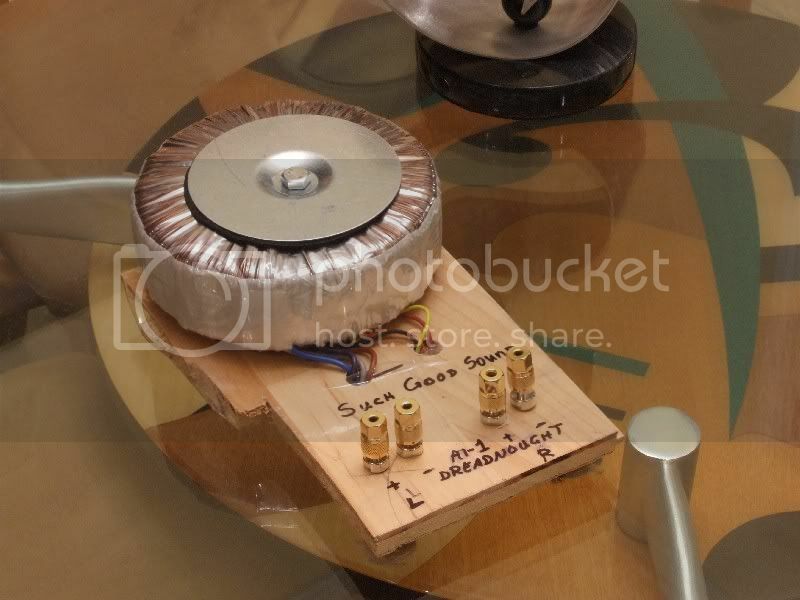 Be really interesting to place the factory AI-1 transformer inside a sheilded enclosure instead of its plastic enclosure as well , and see what kind of improvements are possible in that regards. Doest it matter which negative binding post you connect the "blade" to? Specifically 2.3 tl's with jumpers in place,, upper or lower ,, or either? It does not matter with regard to electrical connectivity as long as the jumpers are in place. I would prefer to connect the AI-1's negative leads to the lower negative binding posts because the SDA signal would not have to go through the jumpers. If you have replaced the stock jumpers with thicker, higher quality wire, you may not hear a difference between connecting the AI-1 to either the top or bottom negative binding post. If a bi-amp configuration is used in the future with one amp on the high frequency section and another amp on the low frequency section, then the low frequency negative binding post must be used. This is because the SDA circuitry does not affect the high frequency section. Thank you sir,, I'll get my ears on them in about 3 hours.Thanks again. 1. DC Resistance of primary and secondary should be less than .8 ohms and preferably less than .5 ohms. The lower the better. 2. Inductance of both primary and secondary should be at least 10mh. 3. Current capacity to saturation should be 5 Amps minimum. Multiple transformers can be used in parallel to lower the DC resistance and increase the current capacity. Just remember that the inductance is half for two transformers in parallel and one-fourth for 4 transformers in parallel. I have in my stock pile an Adcom GFA-555 transformer which I am pretty is either 700 or 800va. It's primaries and secondaries are both .8 ohms each. .4 ohms in parallel. I am wondering if It would be suitable for an A1? It is setup for dual voltage like the avel counter parts. The Adcom might not meet the 1:1 ratio spec.Its secondaries are what 50-60-ish volts AC? The secondaries were putting out 120vac omitting the center tap. , and the Adcom uses 5(really 3 two are just y'ed). Is it not 2 completely separate windings but joined for the center tap? Likely to give them the option of connecting them in series for 240 volt versions.